When homeless people start to disappear, it's Harley Quinn to the rescue! 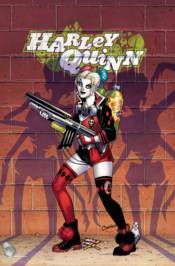 And when she learns that it's the mayor who's behind it all, Harley must put a stop to his scheme. Then, Harley Sinn is released from prison and is out to hurt The Joker! But when he goes missing, both Harleys are on the hunt! Collects issues #14-16 and the lead stories from issues #17-21.